Technology-Portfolio.Net - Finally, Vivo this Chinese company has announced the presence of the newest smartphone officially in the Philippines. This Vivo Y95 is a version that added a fingerprint scanner from Vivo Y93 which was launched in China without censorship. Because this smartphone carries specifications similar to its predecessor, Vivo Y95 comes with a 6.22-inch wide IPS standard and has HD resolution of 720 × 1520 pixels. For the kitchen, it still relies on the Qualcomm Snapdragon 439 low-end chipset built with 12nm process and juxtaposed with 4GB of RAM and 64GB of internal storage which can still be expanded using microSD. On the back of this Vivo Y95 there is a dual-camera setup consisting of 13MP main sensors and a 2MP secondary sensor. While for selfies you can use a 20MP resolution camera that is placed right on Notch Waterdrop. Vivo advertises various AI enhanced features including Night Mode and unlocking faces. Inside there is a battery with a capacity of 4,030 mAh and for the operating system that is running is Android 8.1 Oreo and wrapped with the Funtouch OS 4.5 interface. 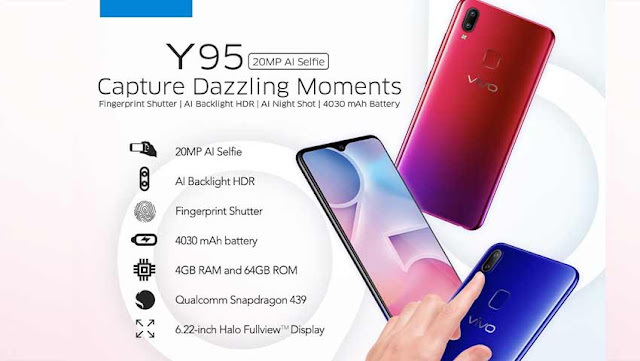 Currently Vivo Y95 is still available in the Philippines market only, and it is not yet known whether it will be launched in other markets as well. As for the price, the smartphone is priced at 13,999 pesos, equivalent to $ 266 USD and is available in a choice of gradient colors, Starry Black and Aurora Red.